How to make and maintain your DIY chalkboards so that you can continue to use them for years to come. I frequently receive a variety of questions about how I maintain the various chalkboards I have (or have had) around my house. While I haven’t had one on display since last Christmas’s Hot Cocoa Bar, I decided it would be a good idea to pull together my process for creating and maintaining my chalkboards as well as a few other random tidbits! When I’m making chalkboards, I prefer to use cheaper frames that come with plastic or acrylic frames. I’ve found in the past that the paint adheres much better to these than to glass fronts. Wipe the plastic or glass with alcohol before applying the paint and make sure that there’s no lint or other debris that might prevent the paint from sticking. Use a foam roller to apply the paint, starting by rolling up and down then left to right for the second coat. Finally, apply a third coat up and down. Let the paint dry for 24 hours. This step is vital to allow the paint to cure. Once cured, you can move on to the priming the paint. 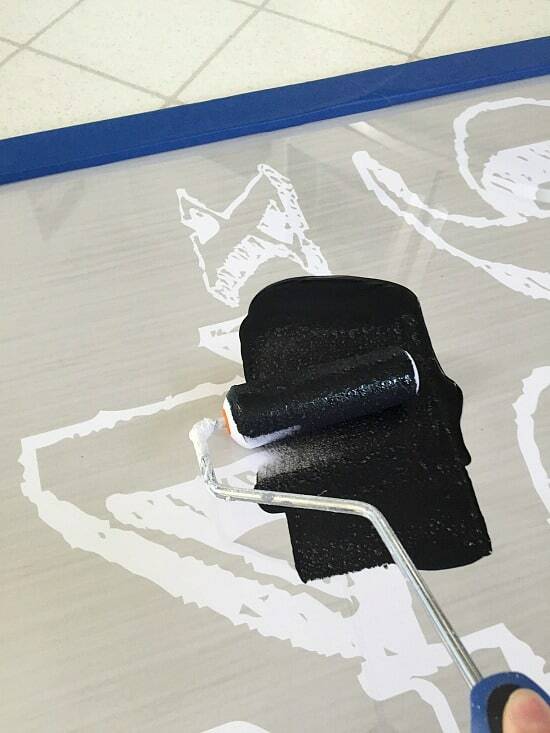 When it comes to chalkboard paint, priming is an essential step. It’s basically “breaking in” the chalkboard. All you need to do is rub the side of a stick of chalk all around the surface. Don’t be too aggressive, you don’t want to dig the sides in and scratch the paint off, just roll the round side of the chalk around. Chalk paint is porous so if you skip the priming step, you run the risk of your first drawing being stuck there permanently. Rub off the chalk with a dry rag to erase it. Now you’re ready to draw, write or whatever you want on your new chalk board! To clean the chalkboard, use a damp (not wet) rag and wipe clean. I like to touch up the paint every 6 months to a year with a fresh coat of chalkboard paint. Be sure to prime it again once it has dried. Like this post? Learn how to do fun lettering on a chalkboard with any printed text or how to make a chalkboard effect without any paint. Yes! Chalk paint is a type of paint created by Annie Sloan. It’s used to add a chalky, aged texture to furniture. It is not the same as chalkboard paint. How well does chalkboard paint work? If you follow the steps above, it works great! Skip and step and you may be sad! How do you cure chalkboard paint? “Curing” simply means drying time. Technically, chalkboard paint will be dry enough to use within 24 hours. But like most paints, it takes a full 30 days to fully cure. Do you have to sand before you use chalk paint? If you are painting over a plastic surface, then no. Lightly sanding over glass will help create some texture that will allow the paint to adhere better, but it’s not necessary. Don’t forget to pin this project for later using the button below or by hovering over any image within this post. What will happen if I don’t do any maintenance here?